Ben Mueller who wrote this post. 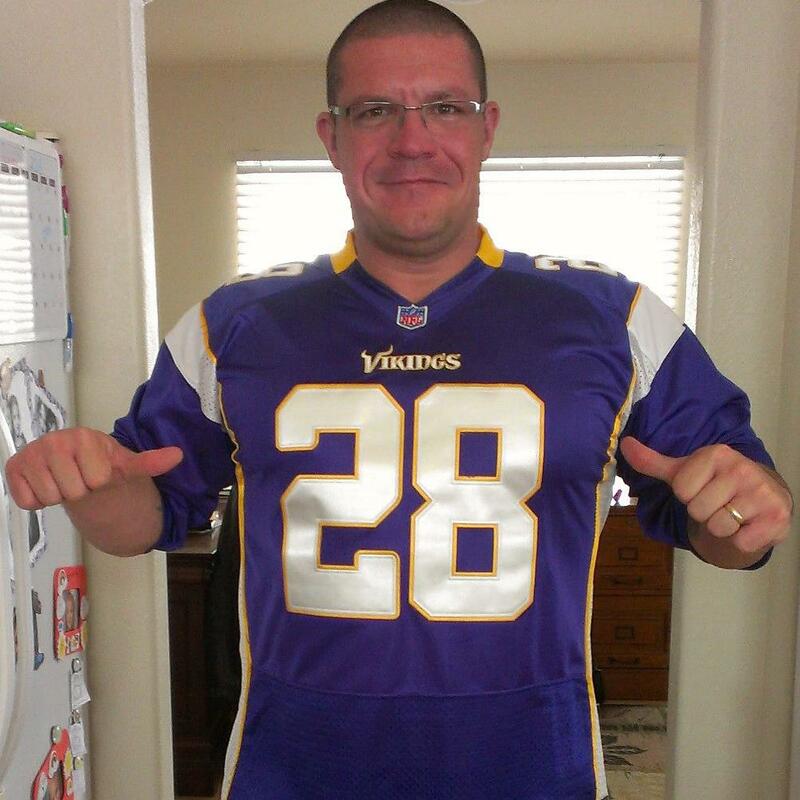 I almost didn’t honor him with a picture considering he’s wearing a Vikings jersey when he lives in Denver! I want to set up reasonable expectations for your weight loss while using the Benew Weight Loss System. Unfortunately, we live in a society where everything that we want to happen needs to have happened YESTERDAY. Basically, we want our lives changed overnight. But, we all know what the truth is; “Anything worth anything takes hard work AND time!”. I have been using the Benew Weight Loss System myself since the beginning of November (’12). When I was asked to be part of the beta test group for this product, I did not follow the protocol that was laid out for us. This included; calorie restriction, more exercise, following a meal plan, etc. Why did I do this? I wanted to see exactly what the effectiveness of the product would be. As we all know, if we restrict caloric intake and exercise more, we will lose weight, but before I started talking to people about this system, I wanted to know that the products did what they said they would do. I have worked out for the last 25 years, so that was not an issue. I would just maintain my same workouts (45 minutes cardio per day and each muscle group lifted once per week). My caloric intake stayed at about 3,000 calories per day and, my ability to maintain a loving relationship with Peanut Butter did not change! The first week of using the system, I lost 6 pounds. This could have been due to the detoxification process (Bepure). I replaced one meal per day with the chocolate Befull. I actually just added Befull on top of everything I was eating, therefore probably added a few calories on some days, but others I didn’t eat as much, therefore still maintaining 3,000 calories per day. In terms of the Belean, I had one packet when I woke up on an empty stomach, and one before lunch (empty stomach) so I could get the most out of the product as possible. In the first 6 weeks of using the system, I lost a total of 17 pounds. The ONLY difference between how I approached weight loss before Benew and after was that my workouts grew in intensity because of the energy I was getting from Belean. I literally was working out like I had done while I played college football. From my 6 weeks until about 9 weeks, I actually gained weight. This was mainly due to the Christmas holiday and my love for homemade fudge! From week 9 until now, something very magical has occurred. Yes, I was losing some weight on the scale in the beginning, but in the last several weeks, the SHAPE of my body has changed dramatically. My theory is that it took a good 2 months before my base metabolism actually changed enough to where my body became a FAT BURNING MACHINE. Yes, the Bepure helped my body clean out all the toxins that had gunked up the system and blocked me from being an “efficient organism”. Yes, Befull allowed me to ingest high quality protein in my body for muscle development and to help curb cravings for sugar and such. BUT, Belean, the metabolic enhancer, has been my “saving grace” in my venture to losing weight. The combination of the Green Coffee Bean, White Kidney Bean, Meratrim, Raspberry Ketones, Green Tea, etc, has actually been exactly what it promised to be; a natural way to significantly increase my base metabolism! Overall; I have lost 28 pounds, my pants went from a 42 to a 36, I have increased muscle mass significantly (or maybe I can just see more of the muscle due to decreased fat), and my energy has sky rocketed. MY WIFE: Jessica, my wife, got on the Benew Weight Loss System the same time I did and did NOT change her eating habits significantly either. She had almost the same exact results as I did. It took her metabolism two months to really get into a fat burning state. She was beautiful before, but now it as a place where she is happy with how she looks and has had to go do some serious clothes shopping! IMPORTANT: As I stated above, I did not follow the protocol that was laid out in front of me when starting this system because I wanted to see how the products affected me. I would NOT suggest that you do this. Obviously, if you combine all the tools that the Benew Weight Loss System has, you should have even better results. If you take the products as suggested, follow the meal & fitness plans as best as possible, and get plugged into “Benew Nation” on Facebook, there is no stopping you! 1) You may have to decrease the amount of Belean that you are ingesting in the beginning. For some people, we have noticed that it gives them TOO MUCH energy and they have a hard time sleeping at night. If this is the case, please start by taking 1/2 packet every morning and that’s it. After 5 days, move to 1/2 packet twice a day. After another 5 days, move to 1 1/2 packets per day, and within 5 days, move up to 2 packets per day. 2) You may GAIN weight in your first week! This has everything to do with WATER RETENTION. It does not mean that the products aren’t working, because in fact, they are. Any time that we are using detoxification products or start a weight loss regiment, our bodies tend to hold on to water, especially when we introduce a metabolic enhancer. When the body heat increases in a person, we hold on to water just like on a hot summer day, our bodies get a little “swelled”. Again, don’t panic, just keep going! 3) The typical healthy weight loss figure that has been published by experts in the weight loss industry, is 1-2 pounds per week. Therefore, do not panic if, in the first month, you only lose 4-8 pounds. When people drop weight too quickly, the propensity for it to come back increases many fold. Just keep trucking along and you will eventually get to your goal weight. 4) You HAVE TO give this system 3 months in order to realize the full benefit. No, this isn’t a sales gimic, but rather being realistic. Yes, you should lose some weight in your first month using the product, but it takes time to get the metabolic engine burning efficiently. Remember that it did not take just a month to get our bodies into the shape it was before Benew, therefore, it is going to take some time to get out. The MAIN CAUSE of being overweight is our METABOLIC STATE. Our metabolism has been set at a very inefficient position for a long time, therefore, when introducing the ingredients that are in Belean, our metabolism is going to take its sweet time in starting to really burn at a speed where massive weight loss is happening. You bet, Lauren! Glad the blogs are helpful!